Many years ago, I crocheted some snowflakes for my Christmas tree. But, true to my procrastinating nature (aka: other things were more important to do, so this got pushed to the bottom of the list), I waited until last week to stiffen these crochet snowflakes. Now don’t get me wrong, I don’t always procrastinate. But I find myself doing the crocheting of projects quite easily, while the finishing of many projects takes me a lot longer to warm up to doing! Are you the same way? Also, I don’t relish the idea of getting the stiffening solution all over my hands! I suppose I could always wear rubber gloves, but where’s the fun in that? Last week, I was inspired to stiffen these snowflakes because of a crochet design that I just finished for a major crochet magazine (the design is still a secret, but you’ll find out in about 6 months what it is when the magazine comes out). I’d guess that not too many people have stiffened crochet snowflakes or know how to do it, so I decided to write a tutorial on how to stiffen them. 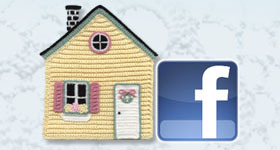 You can find it right here on my “Tutorials” page. So if you’d like to learn how to stiffen snowflakes, then please take a look at the tutorial. I’ve had this book for many years (it was published in 2001). My copy isn’t that pretty anymore because I’ve taken it with me to many places, including little league baseball games when my sons were much younger. Since I love thread crochet, these snowflakes were a natural project for me to make! If you enjoy working with crochet thread, why not give some crocheted snowflakes a try! You’ll be glad you did and your Christmas tree will look fabulous!!! 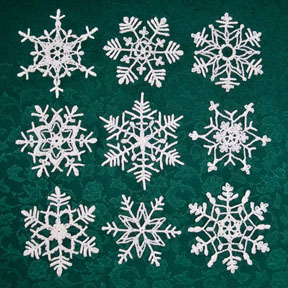 Or if you’re looking for a unique gift, these snowflakes make fabulous gifts! 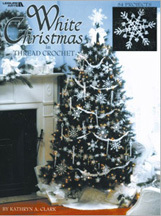 This entry was posted in Crochet book, Crochet Snowflakes, Thread crochet, Tutorials and tagged crochet, crochet book, crochet snowflakes, crochet tutorial, thread crochet. Bookmark the permalink. Wonderful info for stiffening snowflakes! I’ve made many, many different snowflakes (I add beads to mine) and have been using a sugar/water stiffener. I found it doesn’t work well on the metallic thread (especially gold) that I used for the ones I made for presents this year. I’ll try your recommendation for future snowflakes. Thanks. I’m so glad that you found my Snowflake Stiffening tutorial helpful. I’d love to see your snowflakes. They sound very pretty with metallic thread and added beads!